Downton Abbey throws open its doors for a day so that anyone willing to part with a sixpence can have a snoop around. 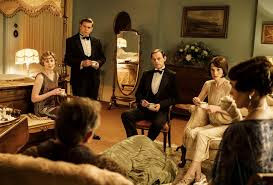 It was an episode that showed us very clearly where the world is heading and, more importantly, gave us insight into the Crawley family and their staff as we come to the end of this story. Mary and Tom are opening up the house because they know it will make money for the hospital. The older generation cannot understand why anyone would be interested in seeing where they live. I understand this. For them, Downton Abbey is home. It is not a grand house with huge rooms and great art. It is the place where they eat, sleep, and recover from major surgery. Just how little the Crawley family pays attention to the house was made clear as the women led their groups of ten around on their tours. None of them has the slightest idea of the house’s history, to the degree that Cora doesn’t even know where the name comes from. I found their lack of knowledge astonishing, but interesting. To live in such a house for so long and not have picked up anything about it shows us just how little the family thinks about it. The tour did give Bertie a chance to shine as he organized it all. 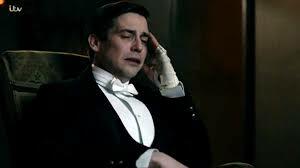 He also managed to impress Cora and Robert enough that they won’t meddle too much if Edith decides to marry him. The scene in which Cora and Robert discuss the idea shows us just how far these two people have grown since we met them. They are no longer worried about titles or money -- at least not too much. They just want their daughter to be happy. Mary’s romance is flourishing as well. Henry is a good match for Mary. Like her, he is willing and able to say exactly what he means, consequences be damned. He continually surprises Mary, which she finds attractive. I do hope she finds a way to get around her fear of the automobile, but I can imagine how difficult it would be for her to watch someone else she loves drive far too fast. Mary and Edith’s bickering is intensifying. While it was all a bit understandable back in the days when they were younger, now it is disturbing. Each of these women has a life, a family, a job. Yet, they can’t seem to be able to move on from the constant sniping at one another. I’m beginning to wonder how they will end. They’re coming together as friends just won’t work as there has been too much bitterness on both sides. Mary will eventually let slip that she knows the truth about Marigold. I do hope that these two women can find themselves able to come to some sort of detente over their children. The final scene with the family was the perfect way to end this episode. They are all collected in a small, cozy room without a servant in sight. There are no sweeping halls or paintings by Reynolds. Instead, it is just them, talking quietly about the future. Yes, Mary may think the Crawleys will live there forever; we know differently. As I watched this episode, I had a sense of ending. Everyone is coupling up, stories are winding down, no real new plot threads are being developed. It was a fun episode, not too demanding or shocking, but lovely to watch. — Many of the manor houses in Great Britain are now open to the public. Many are now cared for by either the National Trust or English Heritage. One pays a great deal more than sixpence to walk around. A plug for charity. If you live in/will be visiting Great Britain, join both of these organizations. They do spectacular work in maintaining the beauty of English history. — I was so pleased to see a Lady Violet/Isobel BFF scene. They always make me smile. — I was glad that Mrs. Patmore found the letter than Daisy had thrown out. Daisy is getting ready to sit her exams. It is time for her to grow up. — I hope that Mrs. Hughes runs out of patience with her new husband soon. That’s a scene I am quite looking forward to. — I love the idea that Thomas spends part of his days playing with the kids. It’s a side of him that warms my heart. Watching him fall apart after Carson scolded him broke it. — God bless Molesley. He is one of my favorite characters of this season. ChrisB loves all things English, especially period drama, the National Trust and English Heritage.